Altus Windows was founded in 1984 by Peter Barratt. Altus were the first manufacturers of UPVC windows in the Hinckley area. Back then, the company was based in Wolvey until 2001 before moving into a new factory on the Station Road Industrial Estate in Market Bosworth. This chapter of the business concluded in 2003 when Mr Barratt retired and a former employee, John Croxall took control of the business. 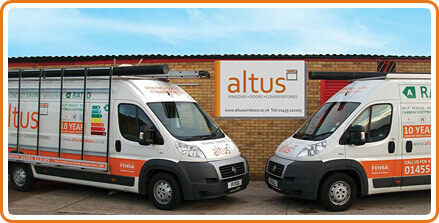 Altus Windows do not employ salespeople or sub-contract installers. Fitting of our products is headed up by two long-term employees, in Gareth Oliver and David Sweeting, both of whom have been with us for over 10 years. John stepped down from his role in 2015 to pursue other avenues in the glazing industry. At which point the control of Altus Windows was delegated to Gareth, in whose capable hands the company continues to flourish and further its local reputation for excellence. Our company ethos is one of complete quality and value for money. We have not advertised for many years, and 100% of the projects we work on come from recommendation. The products that we supply are all market-leading brand names that are fitted very carefully to give the best possible finished job.